Our two sons, Joshua and Jason, who are twenty-years-old, live with us at home while they attend college. Our two daughters Alyssa and Courtney and their husbands live about an hour and a half away. Just a week ago, our daughter, Alyssa gave birth to our first grandchild, a little girl named Aly. There are times when I miss my daughters and I can't tell you in words how much I miss my granddaughter and I cannot wait until I see her tomorrow. 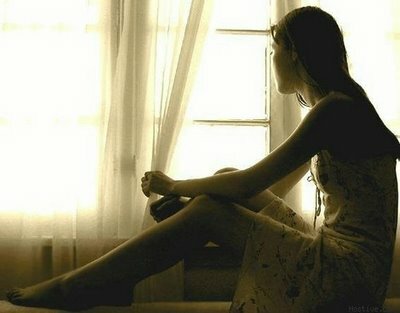 Sometimes I have a sense of loneliness because they are not around. Even though four of us live in our house, and I enjoy the presence of my wife and sons, sometimes in thinking about my other children who live elsewhere, the house does have a somewhat empty feeling. I truly realize this when our daughters and sons-in-law come to our house and spend the night. Having everyone there makes the house feel satisfyingly full. But what it means to be alone depends upon where we stand. I was speaking with another father recently. His children are married and living on their own. His wife died several years ago. In our conversation, I realized that where my house sometimes seems rather empty, his house is truly empty. When he comes home, he literally enters an empty house. In those moments of conversation, I realized that my small sense of loneliness was nothing compared to the loneliness he actually experiences. What it means to be alone depends upon where we stand. While it is certainly possible to be alone in a room filled with people, there are many persons who are truly alone all by themselves, who would wish for a room filled with people just to have a human presence. When I was a young pastor, I did not appreciate the ministry of presence. I can remember in my first church having to visit a man who had a stroke. He could not communicate, he could not move; he could only look at me. I would speak with him informing him of what was happening in the church, I would read Scripture to him, and I would pray with him, but I would always leave feeling as if I had failed him. I did not understand that in his condition, what he probably desired most was simply the presence of another. In the midst of his great suffering, Job's friends sat with him for seven days and they did not say a thing. Now when Job's three friends heard of all these troubles that had come upon him, each of them set out from his home-- Eliphaz the Temanite, Bildad the Shuhite, and Zophar the Naamathite. They met together to go and console and comfort him. When they saw him from a distance, they did not recognize him, and they raised their voices and wept aloud; they tore their robes and threw dust in the air upon their heads. They sat with him on the ground seven days and seven nights, and no one spoke a word to him, for they saw that his suffering was very great (Job 2:11-13). What it means to be alone depends upon where we stand. What it means to be a presence to those who are alone depends upon our desire to be like God who has graced us with his presence in Jesus Christ. We must not forget the importance of our presence, especially in this holiday season. So many people around us don't need more stuff; they need to know they are not alone. Sometimes we don't need to do anything for people; we just need to be there.